I made daikon no niku maki (daikon wrapped in meat) as part of supper tonight. As I previously mentioned, the word niku (meat) usually means pork in Kanto (Eastern Japan), while it usually means beef in Kansai (Western Japan). 1. Cut daikon into rectangles each measuring about 5 x 1 x 0.5 cm, sprinkle with salt, and let sit for 5 min. 2. 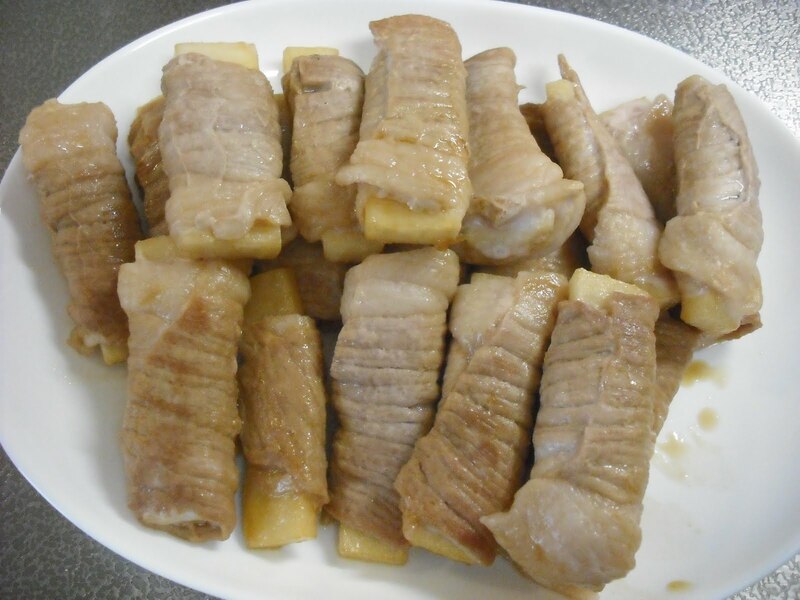 Cut thinly sliced pork in half (each measuring about 15 cm in length) and wrap each daikon rectangle. 3. Place each daikon wrapped in meat in a frying pan, with the meat end side down, turn on the heat, and put on the lid. No oil is necessary. 4. When the upper part of each daikon is done, turn over, and put on the lid to heat the other side. 5. Mix 30 ml each of mirin, soy sauce, and sake, and add to the frying pan. After I transferred the daikon to a plate, I had to cook the unused daikon rectangles by first microwaving for 2 min. and then simmering in the frying pan. I later sprinkled some white sesame seeds. I think I’ll include some of them in the bento for my son tomorrow.